Our new Clinic & Specialty Center opens on March 26th, and the new facility is spectacular! The opening of the Clinic & Specialty Center launches a new era of healthcare in Minneapolis, as we combine primary and specialty care, outpatient surgical and procedural care, rehabilitation, radiology and a variety of other services in a state-of-the-art facility designed as a healing environment to meet the needs of our patients. You’re invited to join us for our Community Open House and see this beautiful facility and learn more about what we will offer our patients and the community. The Open House will be held Saturday, March 17th from 10 am – 2 pm. 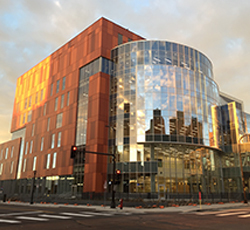 The Clinic & Specialty Center is located at 715 South 8th Street, Minneapolis, Minn.
Get a sneak-peak at the building by watching the video below. We’ve evolved, and we’ve grown. Meeting the ever-changing needs of the community each step of the way. Our system has a new identity, Hennepin Healthcare, to help you understand that we are an integrated system of care – working together to deliver clinical expertise across many locations and services, from primary and specialty care, to home care and hospice, rehabilitation, emergency medical services, inpatient care, outpatient clinics, and more. With the opening of our Clinic & Specialty Center on March 26th, we’ll change how healthcare is delivered in downtown Minneapolis and offer an extraordinary experience to our patients who entrust us with their care. We’re here for the emergency and the every day. We’re here to save lives, and celebrate them too. We’re here for every minute of every day. Our employees choose to work for Hennepin Healthcare for many reasons. But, together, they make up one amazing integrated system of care – highlighted in the video below. Visit our new website, hennepinhealthcare.org to learn more about the broad array of clinical services, expertise and offerings we provide the community. The new Hennepin Healthcare Logo – With a vibrancy that reflects the diverse community we serve, the Hennepin Healthcare logo represents the crispness and precision we bring to our work. The chevrons point inward to the patient – at the center of everything we do. They also radiate outward to reflect our connection to the community. The medical sign in the center reflects our core – serving the varied healthcare needs of our patients. Part two: We don’t talk about miscarriages, and we need to. One patient shares her experience and advice to women and loved ones. In the second of Megan’s articles, she provides valuable information for loved-ones to better communicate and support someone who is experiencing a miscarriage. We don’t talk about miscarriages, and we need to. One patient shares her experience and advice to women and loved ones. Overcoming major orthopedic trauma is tough for anyone, even Mathieu Vezies who was healthy, athletic, and ready to take on the world. A bike-truck accident the summer after his high school graduation brought Mathieu months of pain, rehabilitation and a focus on his health and recovery after major orthopedic surgeries. It knocked him off his game for a while but, with the help of the staff at HCMC and the rehabilitating program at Knapp, Mathieu’s planned first college semester was changed only slightly. He stayed at home with his family, rehabilitating and taking his first semester college classes online. With such an amazing recovery, Mathieu was able to head off to college for the following spring semester. “I spent ten days in intensive care and then two weeks as an inpatient in the Knapp Rehabilitation Center. The staff was amazing and really cared about my recovery. They helped me believe in myself. I had several surgeries, have a rod in my femur, and spent three months in a wheelchair.” But Mathieu is thankful and ready to take on the world. Read his story.